Finally I ventured into the sourdough bread meaning naturally leavened bread. I have started seriously baking bread only since last year. It is was not easy for me to work with yeast, first they won’t corporate, now I feel that phrase is wrong, in fact I did not know how to handle them. I started making bread with “honey wheat bread” using chapathi flour and bread flour. Then after reading lots of recipes and books on bread baking I came to know that each and every step in bread making is important and should be done in a particular way. Bread baking is not easy like that if you have some wheat gluten in your hand and then dump it on any bread you make. Yes wheat gluten is important, but it is needed only in whole wheat bread. Whole wheat does not produce enough gluten, and hence addition a little bit helps. However if you use whole white wheat flour, then addition of gluten is optional as it contains gluten by itself. Another important factor that I learned is adding the right amount of yeast; it is a misconception that for fluffy bread, you have to dump a lot of yeast. No that is not correct way, and a small amount of yeast is enough. For instance in a marriage ceremony food where you have arranged only for 100 people but if you invite 300 people then food may not be enough. But if you invited only 75 people, then there is plenty of food and everybody is happy. Yeast needs to be happy to perform its own work. Once again, I am not any authority of bread baking; I am still learning, also happy to share what I have learned in a hard way with others. I am always on the lookout for some tips to improve. Coming to sourdough, it has been a long time in the making. I was thinking of starting a starter; however I was not that confident enough to start. Finally Zorra of Kochtopf commented in 100% whole wheat bread with oats and raisins which I submitted for Bread baking day event. She told me that it is not that difficult as I think. I felt that I needed to start my sourdough starter, which meant I had to capture those precious lactobacillus and natural yeasts roaming around in my kitchen as well as present in the flours. 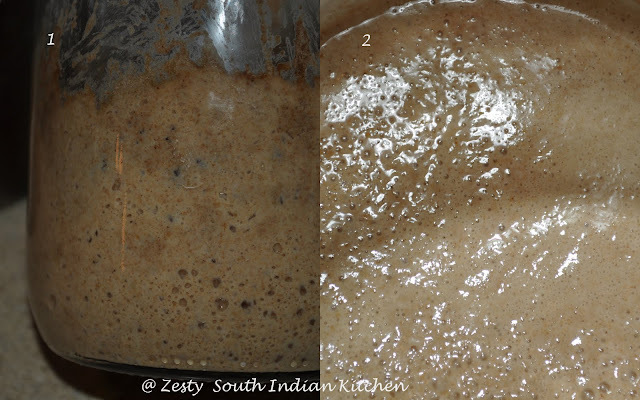 In an Indian kitchen capturing this natural yeast and bacteria is common as in the form of fermenting our dosa/idly (rice and lentil crepe/pancake) batter, making yogurt. Sourdough bread contains lot of health benefits, easily digestible starches, lowering insulin response by improving glucose tolerance. It also protect vitamin B1 from the heat of baking, breaking down the gluten activating phytase enzymes to dissolve phytates thus realizing zinc, iron, magnesium, copper and phosphorus read more from here . Nowadays I am making mainly whole wheat breads, so decide to start a sourdough starter (mother starter) with whole wheat flour and rye flour. I found a good forum on sourdough bread, where they post various write-ups on sourdough starting from how to start to and different recipes. After reading various posts and based on tips from the forum, I was ready to start the mother starter. The first 4 day after setting up the starter, not much was happening. This was exactly like what I had read. From day 5 onwards some activity in the form of bubles should be observed, whereas mine was so silent, no activity. At this point I knew the mother starter was not working and I needed to do some trouble shooting. After reading this link I came to know pH of the medium should be slightly acidic which would enable wild yeast to grow, and for that I need some apple cider vinegar. However my hubby forgot to get some, and I decided to use diluted lemon juice. After adding it, the mother starter was happy and showed some activity and fruity smell. I was happy too because I was able to make mother starter from the scratch. First I made some pistachio raisin bread with some sourdough starter and instant yeast. Then my hubby told me, if you are not using mother starter by itself how would you know whether it is working and good. Thus I tried this garlic bread, which is an adaption of Della Fattoria’s Rustic Roasted Garlic Bread, from the book of Artisan baking by Maggie Glezer. I didn’t want to use the 1+1/2 garlic head as mentioned in the recipe so reduce to 1 whole garlic head (about 12 cloves). I was planning to use Gouda cheese at first, but later changed my mind and made without cheese in them. Instead of oven roasting I did pan roasting of garlic cloves. Both whole white wheat flour and bread flour were used instead of bread flour alone as mentioned in the original recipe. Bread has not so overpowering with garlic flavor with a slight tangy taste, and we loved it. Sure I am going to making it again. Here goes the recipe. Day 1 : Feed 50g water+ 15 g of rye flour and 35 g flour and set aside for 24 hours. Day 4 : remove ¼ cup of contents from the bottle and replace with fresh rye and whole wheat flour and set aside. Day 7: Discard most of the contents in the bottle and add 100 g of water, 70g of whole wheat flour and 30 g of rye flour and also a drop of lemon juice. Set aside for 24 hours. You will see the lot of bubbles and also have some fruity odor. This means you are ready with your sourdough and start baking from tomorrow. However I changed the contents twice and refresh them before and start baking from 9th day. In the evening of day before baking in small bowl, combine the leavain ingredients and mix everything well with wooden spoon or with your hands until well incorporated. Cover loosely with cling wrap and set aside for ferment for 8 hours or until well expanded. On the baking day, in the bowl of a stand mixer fitted with a paddle attachment, combine the fermented levain, flour, salt, and about 85% of the water. Mix in low speed until combined. Loosely cover the dough and set aside for autolyse for about 30 minutes. In the mean time in a small pan roast the garlic cloves in extra virgin olive oil. Once they are cool in enough to touch, crush them with salt using a mortar and pestle and set aside. After 30 minutes and change to dough hook in stand mixer and increase the speed to medium and mix all the dough containing levain with remaining water and until it is incorporated. The dough will be very soft not sticky. Add crushed roasted garlic puree to it and knead well until dough pass windowpane test or register internal temperature of 70F. Transfer the dough to a covered, lightly oiled container. Ferment for about 6 hours at room temperature, with folds after 30, 60, and 90. Initially the dough will be very slack and not hold its shape well, but will have significantly more body after the folds. ( After this proof if you want you can keep the dough in the refrigerator for overnight next morning take out the dough and bring to room temperature and do the second proofing. ). Turn the dough into a lightly floured counter and shape them into a boule/ batard/ loaf shape. Mist the top of the loaf with oil and press sesame seeds if using. Set aside for proof at room temperature for 2 hours .cover the loaf with dusted tea towel. By the end of second proof preheat the oven to 425 F. Keep an empty broiler pan in the lower rack of oven. Add boiling hot water into the broiler pan when you are ready to bake the bread. (This will create steam, necessary to make the thick crust). Bake for about 35-40 minutes or until the center become golden brown, and make a hollow sound when thumped in the bottom. If using instant thermometer, when it is done bread should register 185-190 F. Rotate the loaf pan at 180 degrees in between around 20 minutes of baking. When the loaf is finished baking, remove them immediately from the pans and cool on rack for at least 1 hour, preferably 2 hours, before slicing and serving. Enjoy as much as you wish. Preparation time: For levain: 8 hours, preparation of dough; 25 minutes, first fermentation: 6 hours, second proof; 2 hours, baking; 35-40 minutes. Della Fattoria’s Rustic Roasted Garlic Bread, from the book of Artisan baking by Maggie Glezer. Great efforts Swathi, am yet to try my hands for making sourdough starter, love that comparison..lolz..
U sure r a baker dear.. I am still thoroughly afraid of sourdough but this just looks crazy delicious! WOW, PERFECT BREAD…LOOKS ABSOLUTELY DELICIOUS….LOVED IT..
wow, looks perfect and so mouth watering. What a WONDERFUL loaf! U must be so pleased! That loaf is absolutely beautiful! Yeast is definitely a tricky thing, but once you master it (as you obviously are well on your way to! ), it’s such a great thing! You made the starter yeast..wow. awesome! Informative anecdote, I read it twice 🙂 True,the citation on marriage feast is apt for yeast. Perfectly baked bread. Nice post and a keeper. Sourdough is definitely one of my favorite types of bread. You did a fantastic job on this, Swathi! Sourdough bread looks perfect,thanks for sharing. I love baking bread and have been wanting to try my hand at sourdough for like… forever…. Congrats on your successful loaf, it looks wonderful! There’s nothing better than homemade bread!! Wonderful shots and yummy dishes! I appreciate your efforts for the perfect for the perfect loaf! Perfect Swathi..Loved all the information that u shared with us.And the loaf looks gorgeous. Bread loaf looks awesome. Wonderful preparation. Perfect Bake dear! drool worthy pics…luks gr8! I love sourdough bread. Great with any soup or for bruschetta. Wonderful step-by-step demo to follow! Thanks for sharing! Wowo the bread looks so so yummand perfect. oh amma! was a very big post… Was nice reading the concept of yeast. The bread looks nice and the preparation and presentation was good. swathi loved reading the post and this recipe is bookmarked !! Never tried sour dough yet but yours looks perfect! Wow,great effort,nice detailed stepwise post,bread looks great too! Wow.. what a bread! Looks like its out from an oven in a bakery.. perfect..
What a lovely bread.. you have an award waiting at my blog..
great work dear..bread looks soft n yummy..
another feather added to ur skills dear, that was indeed a great effort surely. The bread looks absolutely great. 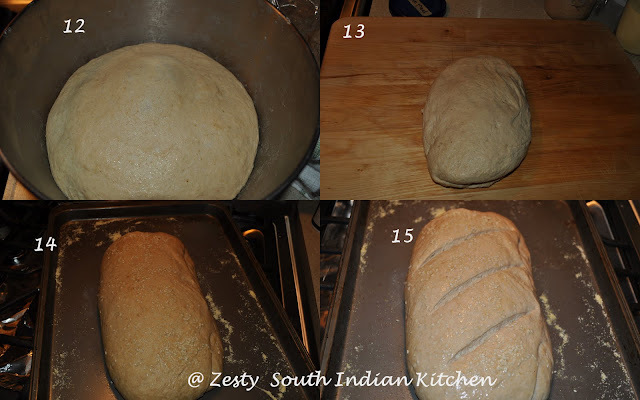 Can empathize how you feel when you bake ur own bread… Keep Rocking! What a good looking loaf, that you for the pictorial. You have done a great job, Swathi..This bread loaf looks perfect! Thanks for the step pics..
rye flour and roasted garlic this is heavenly!! What a detailed process for making sourdough. Thanks for sharing. A Lovely and informative post. Yum! I will keep this in mind when my new starter is ready next week. 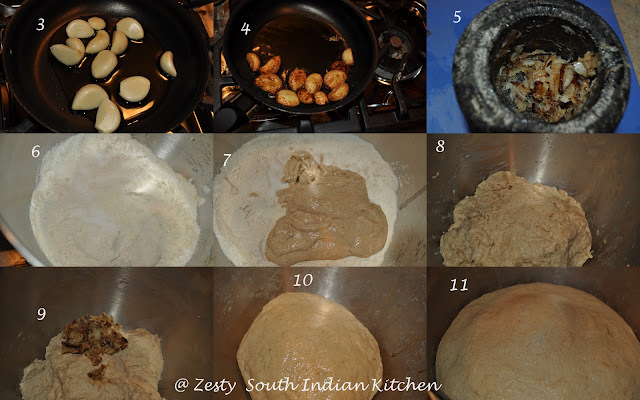 I am so impressed that you made your own starter Swathi! Your bread is beautiful. Like a professional. Thanks for sharing your tips! First time here and you have a great collection here…happy to follow u.. Thanks for the entry. Dough looks absolutely beautiful in the window pane test picture.